Rim rock walls rise vertiginously from the river before me, catching the glint of the rising sun, but my eyes are focused closer, on a stretch of water beneath some alder branches. Large orange bugs are fluttering down from the branches and struggling on the surface. Their struggle is brief; within a few feet of setting sail, there’s the telltale swirl and splash of a hungry trout, and the bug, a salmon fly, is history. “You can get it in there with a sidearm cast,” says my guide, Damien Nurre, the “it” being a Chubby Chernobyl, a fly composed of tan foam with rubber legs that I’m using to entice the trout. After bouncing two casts off the branches, I manage to slide the fly under the alders. One snout comes up and bumps the fly but misses. Another appears and soon inhales the fly, and I’m tight onto what must be the 10th fish of the morning. Many aquatic insects — and the flies we use to imitate them — are quite small; some are dwarfed by the average pinky nail. Salmon flies are an exception. Ranging from 2 to 3 inches in length and boasting an even longer wingspan, they represent serious protein. When the river temperatures hit the low 50s, big, black salmon fly nymphs crawl from the river bottom to shore and plant themselves on rocks, tree trunks, grass and anyplace else where they can gain purchase. The bright orange creature that leaves the black shuck is a sight to behold. The adults may crawl about for several weeks in search of a mate. During this time, the wind that can foul a fly angler’s cast becomes a friend, blowing the hapless bugs into the water. It’s then — and when the females return to the water to drop their eggs — that the top-water feeding bacchanalia begins. The Lower Deschutes flows for 100 miles from Pelton Dam south of the town of Warm Springs to its confluence with the Columbia just east of The Dalles. There are a number of places between Warm Springs and Maupin where anglers can access the river on foot, but the best way to approach the Deschutes’ rainbow trout (and to appreciate the river’s rugged beauty) is to float it by drift boat. 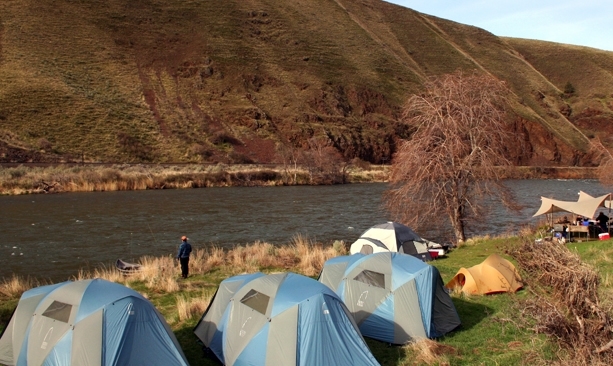 A number of outfitters ply the river, departing from the Trout Creek Campground and drifting the 30-odd miles to Maupin over several days. Guides anchor the boats near promising water below overhanging branches, tall grass or where they spy feeding fish, and anglers wade, cast and, with a little luck, catch! (Angling is not permitted from the boats.) The native rainbows in this section of the river can reach over 20 inches, though even more modest fish will leap and pull out plenty of line. For many, the most exciting moment is when the fish take the fly, sometimes gently slurping it under, other times jumping completely out of the water and gobbling the fly on the way down. You don’t need to be an expert angler to find success. Most guides are excellent teachers and can have novices casting, catching and safely releasing fish in the course of a day. This evening, the scent of broiling steaks mixes with the crisp, sage-scented air. It is just cool enough to slip on a fleece jacket. 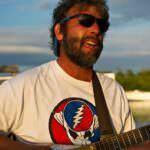 As the dessert dishes (marionberry crumble) are cleared away, guide Michael Divita picks up a guitar and plucks out an improvised blues song. After a few verses recounting the day’s events, he falls silent and leans back in his chair to take in the stars and faint moon shadows on the canyon walls. We all follow suit. I expect to hear coyotes howling, but there is only the murmur of the river and the light rustling of the wind through the sagebrush … reassuring sounds to fall asleep by. 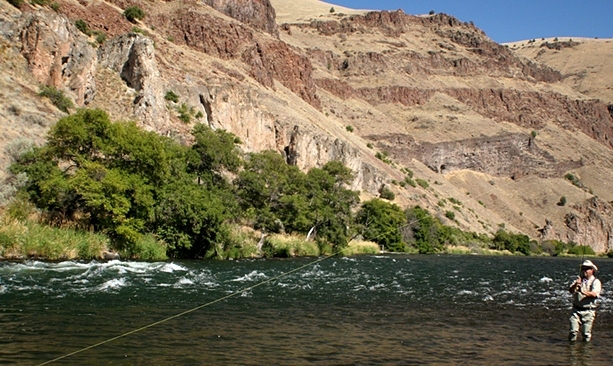 Season: Deep Canyon Outfitters runs fly-fishing trips from May 1 through mid-November. While temperatures and water conditions influence the salmon fly hatch, anglers can generally count on the big bugs showing up in Maupin toward the middle of May and in Warm Springs by early June. 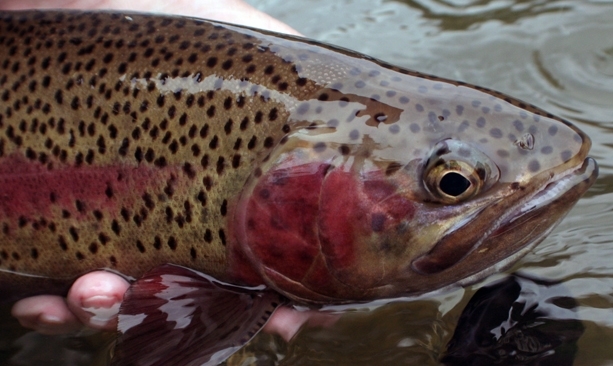 Caddisfly catch follows in early summer, bringing more rainbow trout along with it. Late summer and early fall see continued trout fishing and the start of steelhead season. Equipment: A five-weight fly rod with floating line will work for most situations. 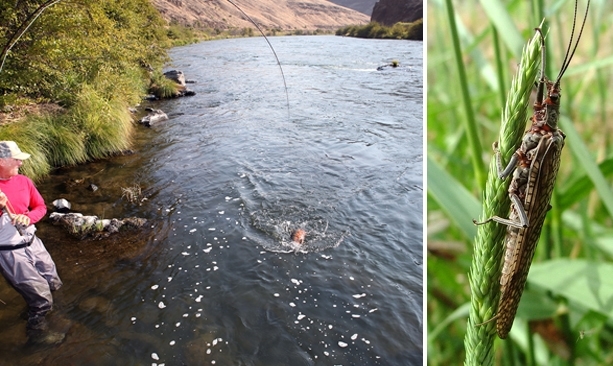 You’ll need cleated boots to go with your waders to help navigate the Deschutes River’s slick bottom. If you don’t have equipment of your own, outfitters can generally arrange loaner/rental equipment. Fishing licenses can be purchased online at www.DFW.state.or.us/online_license_sales. Guides/outfitters: Look for guides and outfitters at the Central Oregon Visitors Association, the Oregon Guides and Packers Association and on our Guides and Outfitters page.